Mixed-media artist, Casey Watson manipulates two-dimensional materials to create sculptural works incorporating bold forms with graphic textures, which are enhanced and vitalized through dynamic lighting. 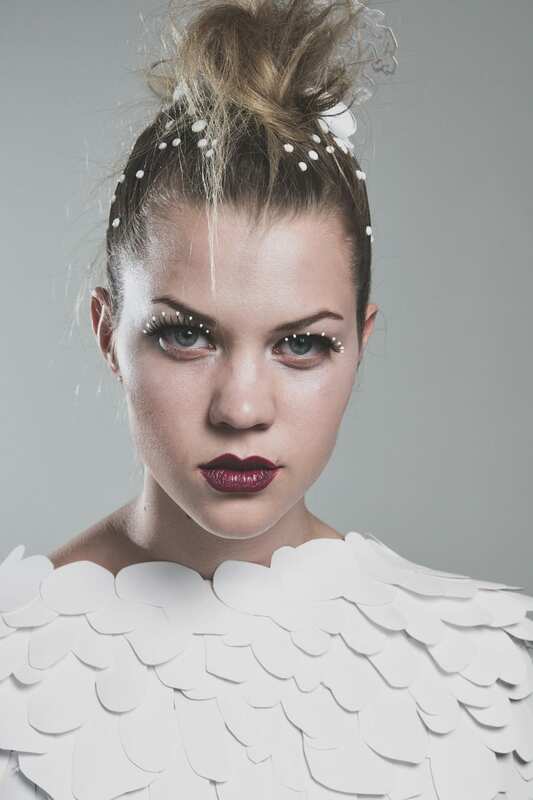 In my recent work, White Reef, I’ve dived into the world of fashion. I see wearable art is an extension of installation which ties into the rest of my art practice. White Reef was awarded 1st place in the 2013 edition of Heels & HeArt, which is a wearable-art competition based in Montreal. The theme for this year’s show was climate change. The concept for this piece was based on images of bleached coral reefs. 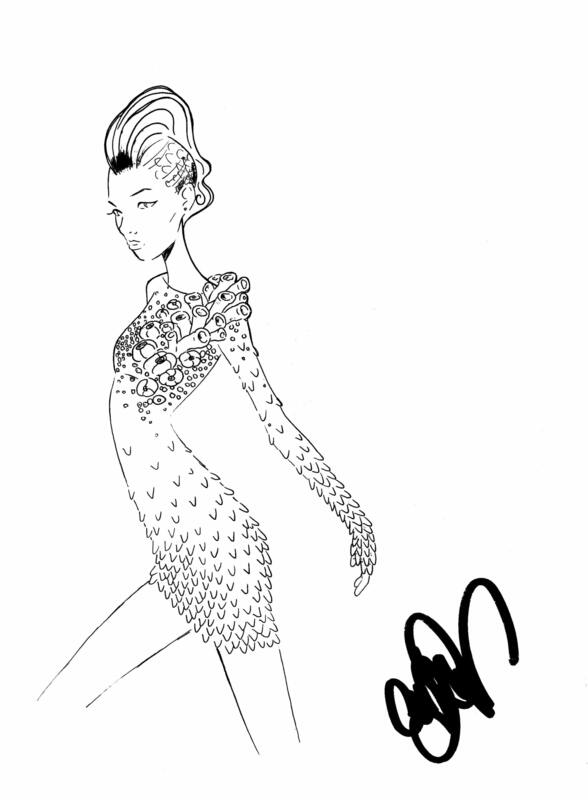 My goal was to use paper scales to build up a coral-like armor, I wanted the dress to look strong but represent the fragility found in the environment. White Reef was constructed out of hundreds of pieces of hand-cut paper. The paper “scales” were laminated with scotch-tape on one edge for extra strength to sew through. Each piece was hand-sewn onto a thin cotton structure (which had a hidden two way zipper in the back.) The dress made a great sound as the model walked down the runway and because each scale was sewn on individually, the fluidly was incredible. The barnacle-like headpieces were also constructed out of paper, while the droplets were just dried dots of hot-glue painted with nail polish! I try to transform my paper-cut works into sculptural pieces, that are not perceived as paper. I love it when the viewer is not sure of the materials I’ve used or is surprised of how they’ve been manipulated. Constellations draws a parallel between the stars and the city lights. 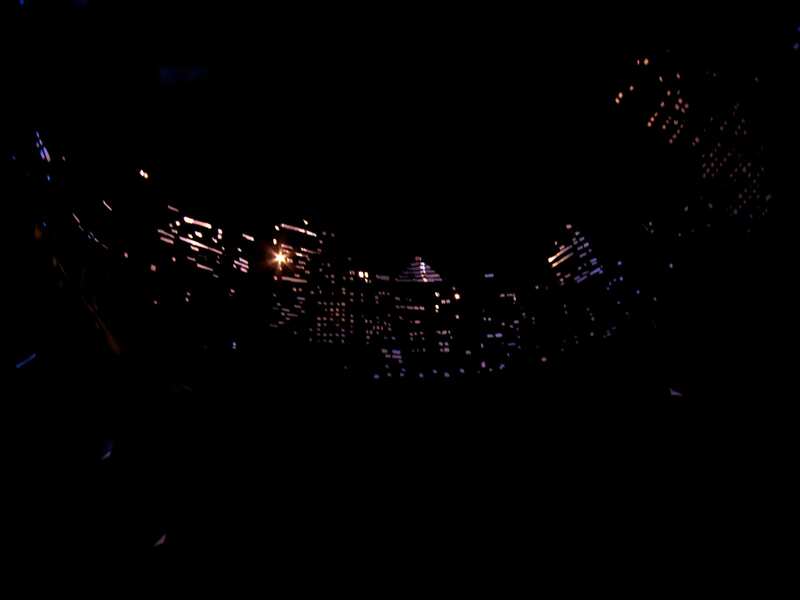 When looking down upon a city, the stars appear to have fallen, captured by the people to light up their homes. It is comprised of inner and outer paper shells with strategic cutouts, which are lit in between by LEDs. The outer layer of the dome displays a starry sky, which is mirrored and transformed on the inside to present the viewer with an intimate look at a cityscape. I used layers of varied black papers to create a cascading texture in order to evoke an expansive sky. When inside, the installation blocks out any other light to provide an immersive experience. Like the symbols and characters that have been created from stars in the sky, I wanted Constellations to compel the viewer to look at city lights from a new perspective – an ever changing mass of patterns, characters and stories. Casey Watson, Constellations, paper, glue & LED lights, 23” x 15”, April 2012. Skin and Synecdoche are part of the same series that play with the modern architectural notion that a building is like a living organism. Inspired by the design of nests and hives, animal architecture is influential to the buildings we inhabit. Working with light and semitransparent materials I intertwine the fragile layers with strong graphic shapes. Synecdoche was wired and programmed by Peter Rockwell so that when the viewer would walk up to it, the lights would pulsate like a heart beat, faster as the person approaches. The macro photos of skin laminated onto the structure were taken by Helene Elsborg. From afar the images appeared as dim textures, but as the viewer approaches the work the lights pulsate faster, the details of skin and hair became clear. Skin was intended to be a totally immersive experience, the viewer had to crawl into the structure. The inside space was comfortable for two to three people. I made two shells, much like in Constellations, with lights placed in between. Being inside was completely surreal, a living bioluminescent cave. Casey Watson, Synecdoche, mixed media, 2’ x 6’ x 8’, August 2011. 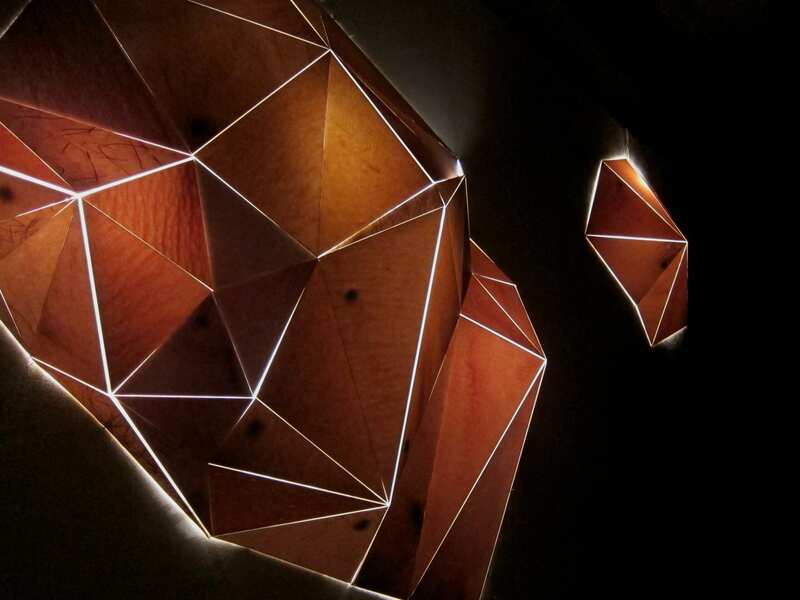  Archived in Uncategorized and tagged Casey Watson, Issue 26, Light, Paper, Sculpture. Bookmark the permalink.